Seriously though, it rained THE… WHOLE… TIME. The sun actually came out on Friday for a few hours, but of course we were inside playing Legacy, the people’s format, so it was fine. I decided to play a slightly different sideboard strategy, and I dropped Stifle for this event because I expected a lot more prison and Blood Moon decks. I’m still not sure how I feel about the decision, because I ended up losing a few matches to Wasteland that the deck typically should have done very well against. [Shameless plug: If you haven’t checked out TopDecked yet, you should! It’s the essential Magic app/website for brewers, collectors, traders, competitors, and fans. It’s a little strange to get seated and have your first opponent almost miss the match. He received a game loss for being late, then we had what ended up being a somewhat grindy game-one where I killed everything he played for a few turns, then finally locked him out with a Jace, the Mind Sculptor and Liliana of the Veil. He conceded when I also played Liliana, the Last Hope. I double checked when he said he conceded, and he confirmed. I don’t know if he would have played it out, but he apparently forgot there was only one game because as we were moving to sideboard I reminded him and he was pretty much like, “Oh yeah, you’re right. Oh well.”… and packed up. I ended this game somewhere around four to seven life. It was fairly close all things considered, before I stabilized hard. Whelp. This is a matchup I never expect to win. It’s rare, but possible. I did squeeze out one game, but any deck that lands a turn-one Blood Moon, turn-two Blood Moon, and turn Three Blood moon is going to be very difficult to beat in a deck with 21 non-basic lands. That’s exactly how game-one went. Blood Moon. I did have the Force of Will, but eventually I could not keep up with a steady stream of Goblin Rabblemaster, Chandra, Torch of Defiance, and Hazoret the Fervent. Game two I actually lived the dream and got to make Marit Lage by Hydroblasting my opponent’s Blood Moon. Game three I mulliganed to 6 and kept a hand that would have been strong if I got any turn 1 play without Blood Moon getting in my way, and I subsequently received a turn-one Blood Moon. This match was fairly grindy, which is not really typical of U/R Delver matches. It’s a fast deck and it usually goes quickly one way or the other. That said, I actually lost my notepad after this round so I don’t have notes from this match. Sorry! I won, 2-1. Marit Lage ftw. Another odd round. I’ve never gotten a bye in round four before, but I sat and patiently waited until 10 minutes after the round, called for a judge, and right after she’d filled out the match slip and started walking away, my opponent shows up out of breath. He appealed the decision to the head judge, but it’s pretty hard to start a new match 20 minutes into a round that has already started. You can’t delay an entire tournament for one match when policy clearly states what happens, and had already happened. The ruling was upheld. Oh well. 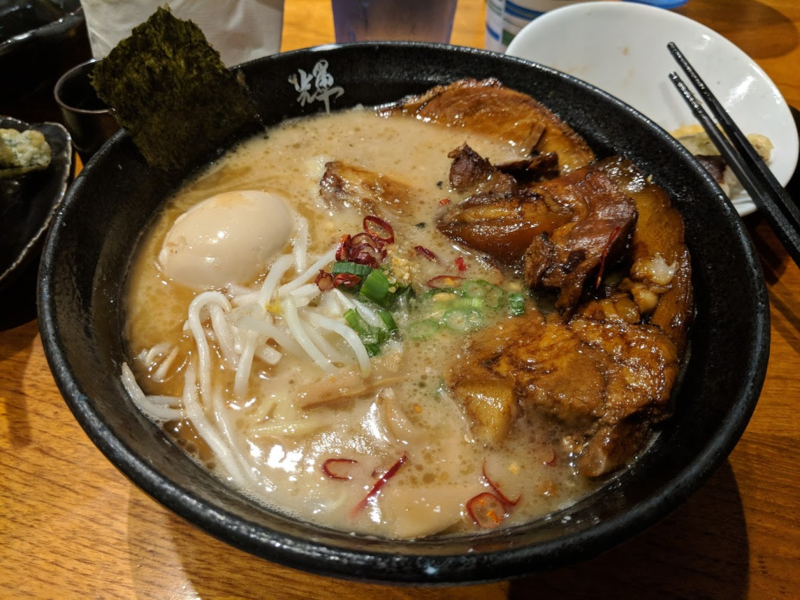 I took a break to go get lunch. 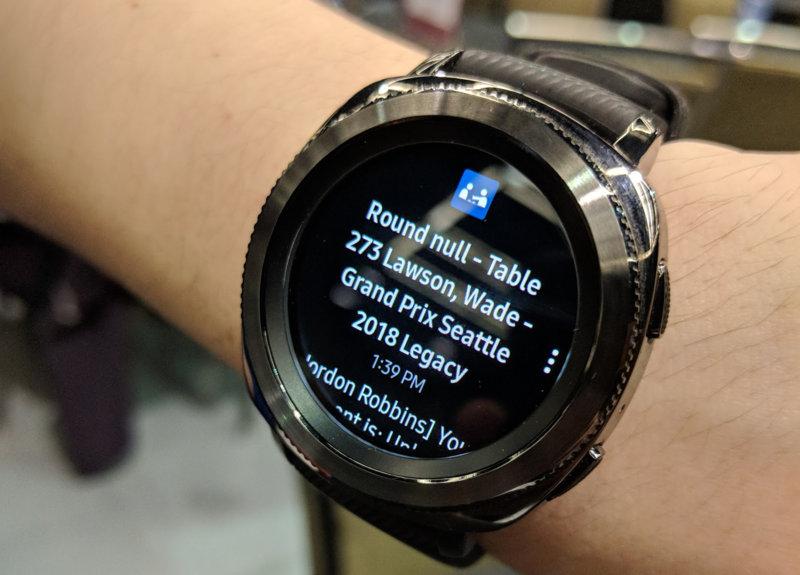 After I got a surprisingly tasty vegan sandwich from “the healthy option” in the convention hall, I sat down to figure out what was wrong with Jordon’s watch, and eat my food. My friends Christian Jorn, owner of www.remora.com and Mike Lefkov found me and sat down for a bit! These are two excellent gentlemen from Colorado and I hope to see them out again soon – they’ve helped me keep going strong with TopDecked – hollar! I… play… like… junk… sometimes. And this was one of those times. In game one, I kept a hand that was … fair. Died quickly. In game two I made a ton of bad decisions, and the only reason this match went to game three is because my opponent made a critical misplay when storming off in game-two. He was trying to play around Mindbreak Trap, facing down a Leovold, Emmisary of Trest. He had 10 copies of Tendrils of Agony, and i was at 18 life. He decided to send one copy back his way to keep me from drawing an extra card, however, this gave me nine chances to draw Force of Will and any blue card, which I did. I countered one copy of Tendrils, and my opponent conceded. Game three was a generic loss. I cast Thoughtseize seeing a bunch of mana ramp and Cabal Therapy. I took the Therapy. Next turn he draws Dark Petition, makes a bunch of mana, and kills me. Oh well. Game one I’m on the play. I keep a hand with Thoughtseize, Crop Rotation, and Force/blue card, … lands. In typical delver fashion, he lands a Deathrite and starts doing Deathrite Shaman things, but his hand isn’t very aggressive. He has Stifle, which I baited him into holding by leaving a Wasteland untapped. He finally decided to attack my Wasteland with one of his own, and I crop rotated for the combo in response. He tried to Force it, but I Forced back. 1-0. Game two he played a turn one Delver of Secrets, flipped it immediately, and proceeded to kill me 7 turns. Not a whole lot to see here. I actually got him down to seven life with a bunch of Deathrite Shaman, but I couldn’t gain life to stabilize because there were no creatures to exile in any graveyards, and he wasn’t providing me any of my own. 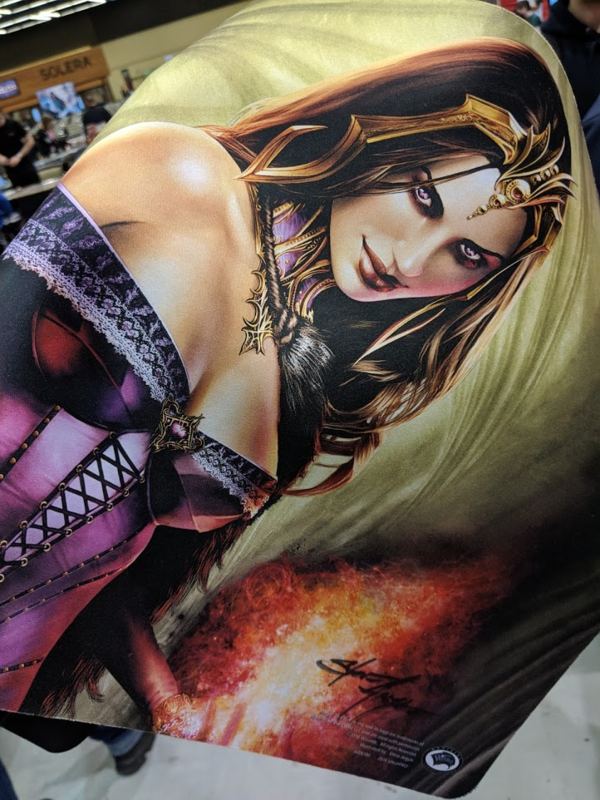 Game three was another nail-biter that ended up with Liliana of the Veil (my playmat for the weekend) stabilizing on a True-Name Nemesis to turn the game around in an agonizing grindfest that finshed with a 20/20. I felt good about this match – good solid clean win. A typically difficult matchup, but this was a great set of games. My opponent had no idea what I was playing for a few turns. He Forced a turn-one Deathrite, and I subsequently played a turn two Deathrite, and another turn two Deathrite. I did lose this game, as I got ground out by value-town. In game two, I brought in every value card I could possibly play. I played Wasteland and Life from the Loam relentlessly, finally winning with a Snapcaster Mage that I landed early. 7 attacks with Snapcaster, and a Creeping Tar Pit activation to finish a turn early. Same game plan. I landed an early Snapcaster and went hard on Wasteland, even crop-rotating away basics and duals to keep my opponent on one land. I was able to keep his Deathrite’s under control and lock in the win. This match went almost identically to the first Grixis match of the day. Though game one was a grind-fest that ended with Baleful Strix and Snapcaster beatdown. Not the typical end of a Grixis game, but I took it nonetheless. Game two I lost to a fast Gurmag Angler that attacked me four times. I couldn’t find a Liliana, and couldn’t get enough mana for Jace. Game three was a combo finish leaving me with seven life and my opponent with -1, day 2 locked in! Team TopDecked meetup! 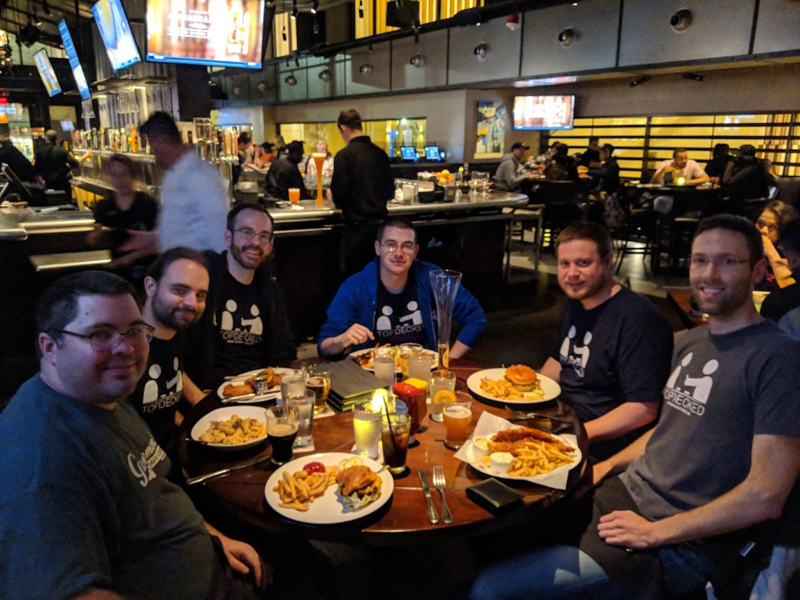 At 9pm we went to Yard House down on 4th and … something… met up with the Leaving a Legacy crew, and a few other TopDecked users who stopped by! After a fitful night of sleep, I was woefully energetic and surprisingly alert for day two. I’d say I typically do my best when I’m sleep deprived, but that’s absolutely false. It’s more that I can never seem to get a good night’s sleep before/during a tournament. Does anyone else have issues with this? How do you deal with it? On with the show. I was on the play. A quick fetch, Thoughtseize revealed Dryad Arbor, Grove of the Burnwillows, Taiga, Thalia, Guardian of Thraben, Scavenging Ooze, and Gaddock Teeg. My hand was full of removal, so I took Thalia and prepared for the grind. MVPs of this game/match were Liliana of the Veil , Liliana the Last Hope, and my good friend Marit Lage. Game one I almost finished with a Tombstalker until my opponent was at 7 life and finally dealt with it via Swords to Plowshares. My opponent’s next turn ended with a double Crop Rotation for a combo kill. Game two was a huge blowout. I landed a turn two Liliana of the Veil, protected her with spot removal and wasteland, and my opponent never recovered. Flawless victory, no damage taken. Another brutal match. My opponent had everything. I did not. Game one ended in just five turns via an 8-damage Price of Progress. I Forced, he Forced back. Game two was grindier, in about 10 turns, but I lost to a Bedlam Reveler after getting my opponent empty-handed, combo on board. I couldn’t block enough damage to swing back for a kill. This was a fun match, albeit a semi-blowout, but those are usually fun, right? Game one I lost, on the draw, to a turn one nut hand Griselbrand into turn two Tidespout Tyrant. Game two was far more interesting. I sideboarded aggressively into combo mode, bringing in Surgical Extraction, the extra Crop Rotation, and Karakas. The game was over in about four turns. I cast Thoughtseize taking my opponent’s only mana source, a Lotus Petal, with plenty of backup in my hand. After four turns of my opponent drawing only a single swamp, I made a 20/20 and finished it out. Game three was a grindier game, but I got an early Deathrite, Snapcaster, and Strix, and rode them to victory. I never needed to cast another spell. Any BUG match is a fun match, and this was no exception. Game one was an insane rocket-ride. I was on the play. My opponent used his first Force of Will on my Deathrite Shaman, proceeded to play his own, then cast Hymn to Tourach. Now, in my hand at this point is something like: Snapcaster, Collective Brutality, Thespian’s Stage, Brainstorm, Crop Rotation, Tombstalker, fetchland. I have two lands on the battlefield, and I can’t cast Brainstorm in response because I’m tapped out. Hymn resolves and I discard Thespian’s Stage and Snapcaster Mage. On my turn three I untap, draw Force of Will, cast Crop Rotation, get a fetchland, fetch an Underground Sea, play a fetchland, fetch, get a Bayou, cast Tombstalker, leaving nothing in my graveyard. My opponent attempts to Force the Tombstalker and I Force back. It resolves! After two successful attacks, my opponent has at this point resolved a Leovold, and finally finds a Baleful Strix. He’s at 7 life. I still have Collective Brutality. On my turn, I untap, draw a card, cast Brutality targeting the Strix, and escalate for the final two points of damage, pre-attack. My opponent draws two cards from Leovold (two triggers) and does not find a Force of Will. Tombstalker crushes. Game two I lost in a super grindfest, and game three ends with an early combo, to lock in the win. Phew! Alright… it’s Karma time. I … absolutely … destroyed … my Infect opponent. I felt a little bad with how absolutely insanely I was drawing. On top of that, I was on the play. I had every Wasteland, every Abrupt Decay, and even Cabal Pit with Loam. Game one actually ended with me at two (regular) life through Noble Hierarch combat damage and fetches/Thoughtseizes. Game two was an even more insane lockout. Liliana the Last Hope, Wastelands, Engineered Plague naming Human (kills Noble Hierarch and Blighted Agent). I ended the game at 20 life and zero infect. I tell my friends that I am going to absolutely get wrecked next round because of how much of a beatdown I just delivered. I’m absolutely correct. Karma. My opponent apparently knew what I was playing before we started (friends with another Baxter BUG pilot at the event), and he crushed me hard. Game one I just can’t stop bleeding life from Deathrites, Delvers, etc. I did manage to land Pernicious Deed and blow up the world, but he locked and reloaded very quickly. Game two he got a Sylvan Library out on turn two and very quickly dropped to six life drawing extra cards. I couldn’t recover from the card advantage, and I’d argue I misplayed by not blowing up the library when I finally could remove it. There was one turn where I should have played Pernicious Deed to kill a Deathrite (and the library) and I killed it with Brutality instead. I was hedging against Tarmogoyf, but I still think this was a mistake even though my opponent was not drawing more cards. Loss. I like, can’t even. Three U/R delver matches this GP. This deck has definitely adapted. Bedlam Reveler is INSANE. I lost in two grindy games, each one with Marit Lage in play, and no way to attack because the crackback would kill me. I eventually got overwhelmed and run through. Overall this event was a blast. Notable cards that I would remove from the sideboard are Hydroblast, and Notion Thief. They were both too situational, and did not do much to sure up the bad matchups (Red… Red…). I would replace them with Collective Brutality and/or another impactful card with general/all-around purpose. I enjoyed having Venser, Shaper Savant as an option, even though I did not make much use of him this weekend. Staying at an AirBNB within walking distance of the Convention Center. Staying with Mark, Mike, Randall, Matt, and last but not nearly least, Bill. Meeting Steve Argyle, buying this playmat (below), having him sign it, then signing a TopDecked deck divider for him to put in his EDH deck. Going 10-5, my third day-2 at a GP with this deck, and having a lot of fun and playing great games of Magic. Getting to see my cousin Aiden, who I haven’t seen in 20 years because we live half a world apart. Getting another pro-point I’ll never use. Great article! Keep up the good match analysis. Where can I find your decklist? Hey Daniel! The TopDecked deck link is near the top of the article 🙂 Nice to hear from you! I hope you’re well. Here you go! Hi Baxter, happy to see that you are still eviling your way through GPS. How do you think the ban of Deathrite shaman will impact the deck?